In this update we take a look at the latest trading update published by SASOL. And the market is not liking what SASOL has to say in their latest trading update. The price is down 5.9% since the updated trading statement. Shareholders of Sasol are referred to the Company’s trading statement released on the Stock Exchange News Service (SENS) on 21 November 2018 (Announcement), wherein the Company indicated that an updated trading statement will be released on SENS in January 2019, once reasonable certainty is attained with regards to the 31 December 2018 half-year financial results. The first derivative unit, linear low-density polyethylene (LLDPE), produced first product in January 2019and beneficial operation is expected in February, approximately two months behind schedule. Utilitiesto support the early process units were fully operational by end November 2018. These utilities together with LLDPE will comprise ~40% of the LCCP existing total cost. Productivity losses exacerbated by high absenteeism around public holidays and construction rework since end November 2018; and Schedule delays of the remaining units will result in additional overhead costs. Management maintains our unrelenting focus on delivering the remaining units per this updated plan and we remain confident that the fundamentals for the LCCP – being, among others, a feedstock advantaged plant, a world scale highly integrated facility, diverse product slate with high margin products and world class logistics and infrastructure – remain intact. As a result of the delays highlighted above, we are revising our LCCP EBITDA estimate down from US$110 – US$160 million to an EBITDA loss of US$165 – US$195 million for FY19. However, we maintain our guidance that LCCP will deliver a steady state EBITDA of US$1,3 billion in FY2022. Share price performance after the Lake Charles EBITDA loss announcement? 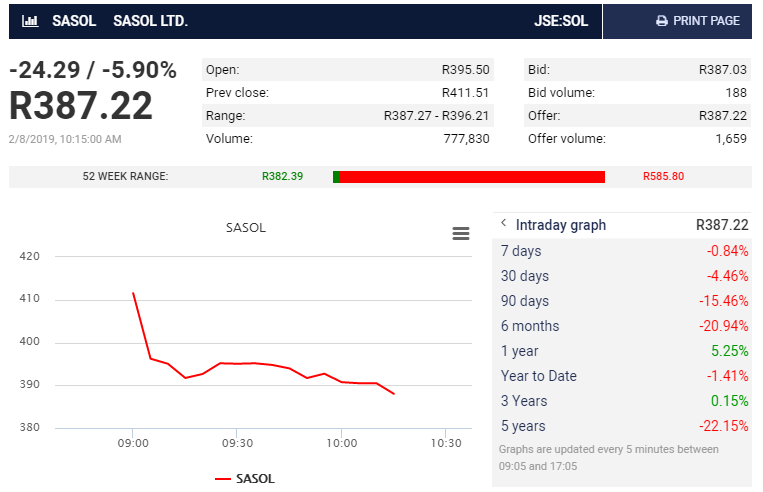 The image below is a screenshot taken from Moneyweb, showing SASOL's intraday reaction to the SENS announcement in which it stated from expecting a EBITDA profit of around $110 million from the Lake Charles Chemicals Project (LCCP) they now expect a loss of around -$165 million.